MH2GO provides affordability without compromising on quality. All our systems are made by highly skilled workmanships and we use the latest technology and materials to create a bespoke and undetectable system. Hair System (50% Deposit) £250 - To be paid when placing a new order. Remaining balance of £245 to be paid after the piece has been fitted. 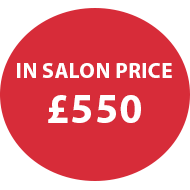 If you purchase a hair system from the salon but decide to get it fitted elsewhere the cost is £395. This is paid fully on the day of placing the order. Why do I have to pay £495 at the salon but it says I can buy for £250 online? At the salon we design a bespoke fully customized hair system. The price includes the hair system and having it fitted. All in Salon hair system orders are made by our highest qualified technicians, the hair we use is hair that we purchase ourselves - Virgin Remy Unprocessed Luxury Human Hair. Extra care and attention is placed with our In salon hair systems and go through a more through Quality Check. The hair systems also come with a 2 month Guarantee. If you have come into the Salon but later decided to have it fitted elsewhere you will be paying £395 and receive all the benefits mentioned above. 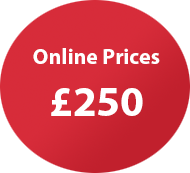 The online prices at £250 do not come with any of the benefits mentioned above and this is solely for "Online Clients" only ie those that have never stepped foot into the salon and provide their own templates, samples and simply placed the orders directly online.